Whew! After a stressful week, it’s a relief to turn my attention to the Davis family and my weekly Family Affair series. I hope it provides a pleasant distraction for you, too. Buffy and Cissy wear slacks. We see stock footage of a baseball game. A doorman who’s not Scotty appears. Someone pronounces “Terre Haute” correctly. The Davis family returns from a trip to Terre Haute to find him gone. You’d think that a French swap might cause enough comic high jinx to sustain an episode. This episode’s plot, however, doesn’t really have anything to do with the arrival of Giles French’s brother Nigel. Instead, this episode revolves around Jody. Spending most of his time with Cissy and Buffy has left him looking for some male bonding. And let’s face it, neither Mr. French is helpful when you want to play catch. Ted Gaynor helps Bill realize that Jody needs some father-son time. 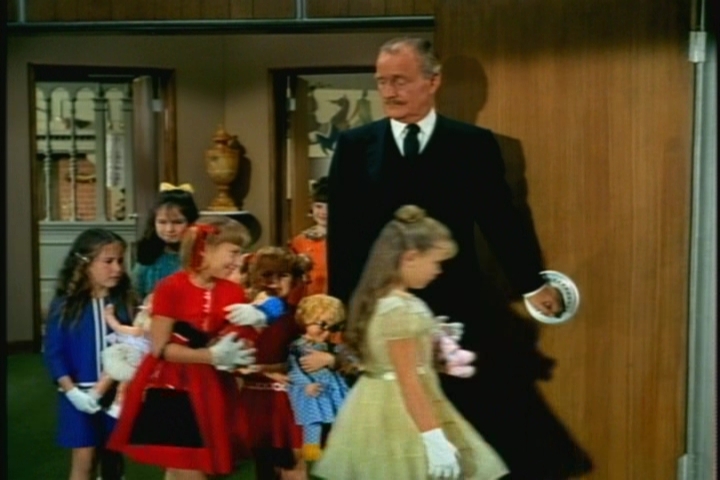 Ted explains that he was raised in an all-female household–or “petticoat jail,” as he puts it. I always sensed that Ted had issues with women, and now I see where it started. Bill invites Jody to join him and Ted at a baseball game. Jody is thrilled to go, but the adults around him block his view of the action. Eventually, he falls asleep, missing Uncle Bill’s foul-ball catch. Baseball has the same effect on me. 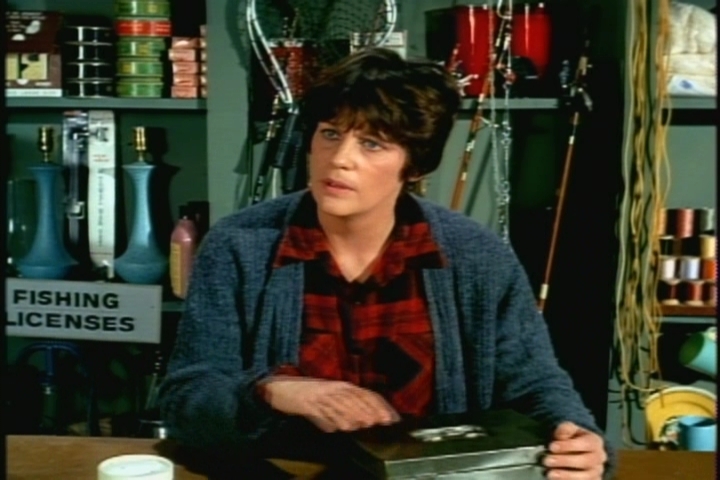 Next, Bill plans a weekend fishing trip with Jody, but work threatens to interfere. When he hears that Buffy and Cissy are both inviting friends over on Saturday, Uncle Bill takes pity on Jody. He brings the boy along on his business trip to Rochester (Rock-chester, according to Jody) and plans to take him fishing when his work’s done. I wonder how Uncle Bill found this nice matronly woman to watch Jody in Rochester…and how he found a hotel with walls painted Family Affair green. Everything on the trip goes wrong—Bill’s work drags on, the camper he’s rented for the fishing trip breaks down, and then they learn the lake where they’re headed has dried up. They learn about the lake from this bait store owner, who sure is a departure from most of the women we see on Family Affair. Jody keeps saying he doesn’t mind, but Uncle Bill thinks he’s just too polite to confess his disappointment. Finally, Jody explains that just spending time with Uncle Bill made the trip enjoyable for him. Awww. Cue the Violins of Emotional Resonance. An Uncle Bill-and-Jody episode always warms the heart. Although Jody-centered, this episode has fun Buffy moments. 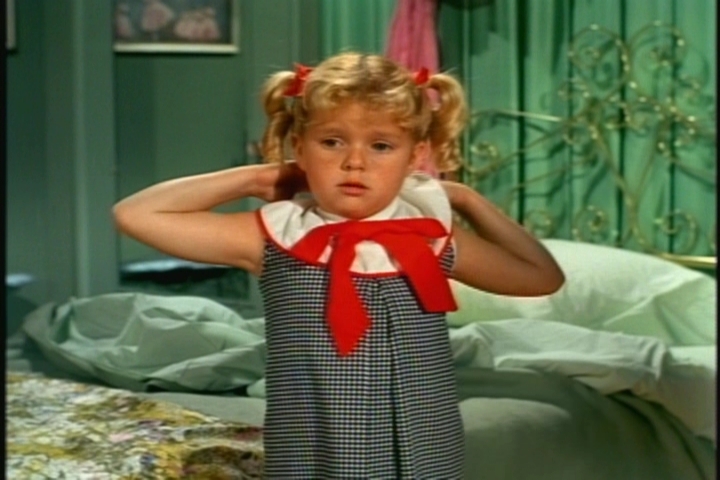 In this scene, she struggles to button the back of her dress, then gives up and puts the dress on backwards. She also exhibits realistic annoyance at Jody’s temporary monopoly on Uncle Bill. And apparently she has friends. Who knew? Mr. Nigel French: John Williams. Ted Gaynor: John Hubbard. Proprietress: Katey Barrett. Doorman: David Brandon. John Williams isn’t exactly a member of the guest cast. During his nine-episode tenure on the show, he takes over Sebastian Cabot’s spot in the credits (Which seems a little odd, actually.) Williams is an impressive fill-in. He had a long and distinguished career that was closely associated with director Alfred Hitchcock. His most memorable role was Inspector Hubbard in Dial M for Murder. (He had won a Tony for playing the same role on Broadway.) 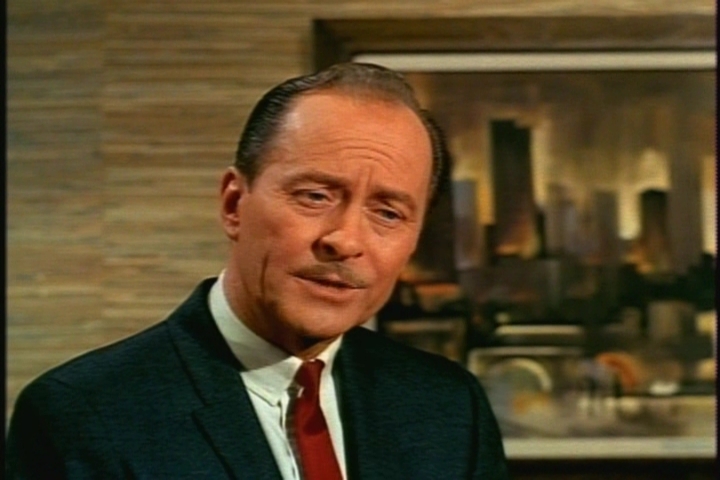 He also appeared in To Catch a Thief and in several episodes of TV’s Alfred Hitchcock Presents. 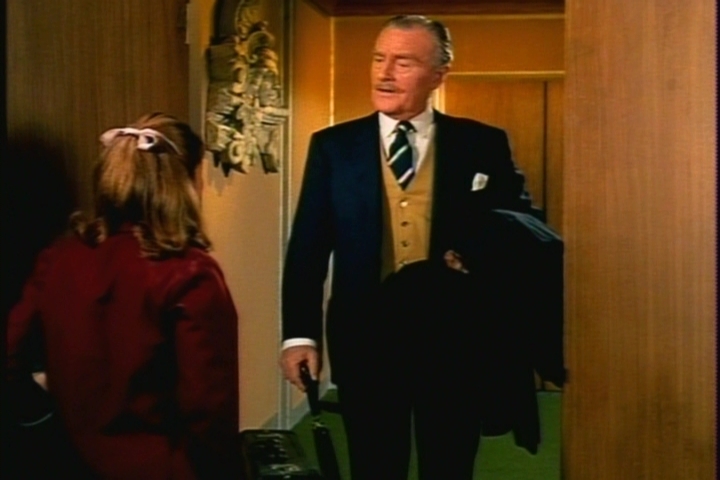 Brandon would appear in several more Family Affair episodes. Terre Haute, of course. Scotty is mentioned, though not seen. The presence of another doorman is explained–he’s the nighttime guy. This article includes a bit about the health problems that led to Sebastian Cabot’s nine-episode hiatus from the series. This entry was posted in Family Affair, Television and tagged 1960s, Anissa Jones, Brian Keith, Classic Television, Family Affair, John Williams, Johnny Whitaker, Kathy Garver, Nostalgia, Sebastian Cabot, Television. I used to love watching this show. Funny how it is not part of the TV Land stable. 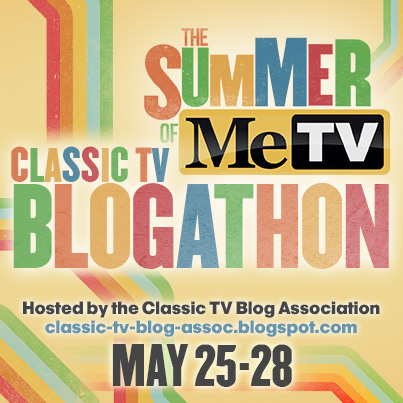 It is a shame that TV Land doesn’t show it anymore. At least the whole series is available on DVD at a reasonable price (in the U.S.–not sure about other places). Thanks for commenting! Honestly, your Family Affair photo captions are brilliant. BRILLIANT. I can’t read this series in a public place because people always give me weird looks when I start laughing. I’m glad you enjoy them! This show just brings out my (affectionately) snarky side. Silverscreening is absolutely right: your captions, with their “slight” touch of irony, ARE just brilliant and amusing. The hotel room not only has the FA green walls, but also the rather ugly yellowish/greenish (?) bedspreads in the former guest room of the Davis apartment prior to its redecoration. Jody is quite a little macho here: “Aw, Cissy, you throw just like a girl,” he says rather disgustedly. Look who’s talking – he doesn’t throw any better! And it will soon turn out that Buffy is much better at playing ball games! I’m always deeply touched by scenes showing the close affectionate bond between Uncle Bill and the kids, the end of this episode being no exception, of course. Ever since I’ve known of the early death of Brian Keith’s son Michael at the age of 8 in 1963, however, I wonder how much Brian Keith is in all this. Shooting with his TV kids must have stirred up memories of his son and this devastating loss, I guess. So in some scenes I wonder whether Brian Keith or Bill Davis speaks the lines. Keith, whose genuine affection for his TV kids is evident, undeniably is a great (much underrated, as you mentined before) actor who has often been described as being very professional. Does “professional” mean to block out all personal feelings, or rather to incorporate them in acting? 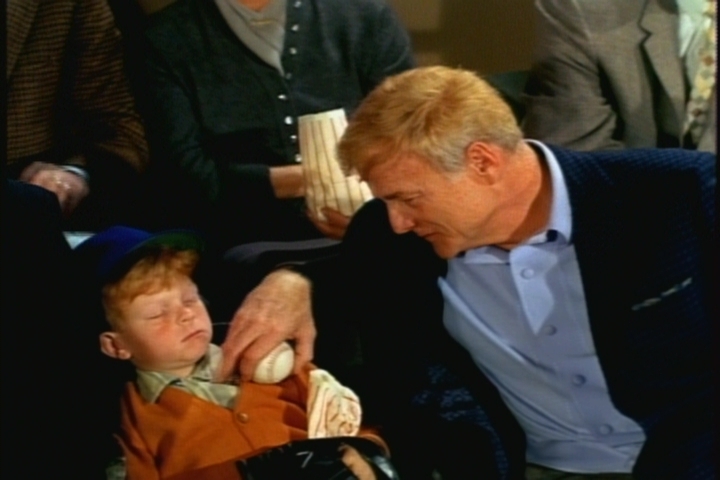 Here a Hardcastle and McCormick scene of 1983 – 20 years after Michael’s death – comes to my mind which I think is 100% Brian Keith (playing Hardcastle): During a conversation with Hardcastle and McCormick, a mobster reminds Hardcastle of his son who died in Vietnam. First, Hardcastle quickly reprimands the mobster by saying: “You stay the hell out of my private life, you hear!” Then, when McCormick later asks him why he never told him about his son he says: “My son is in my memory. I don’t need sympathy from you to sweeten it up!” The melancholy in his voice makes me feel this is Brian Keith thinking of his son. Thanks for a very insightful comment. 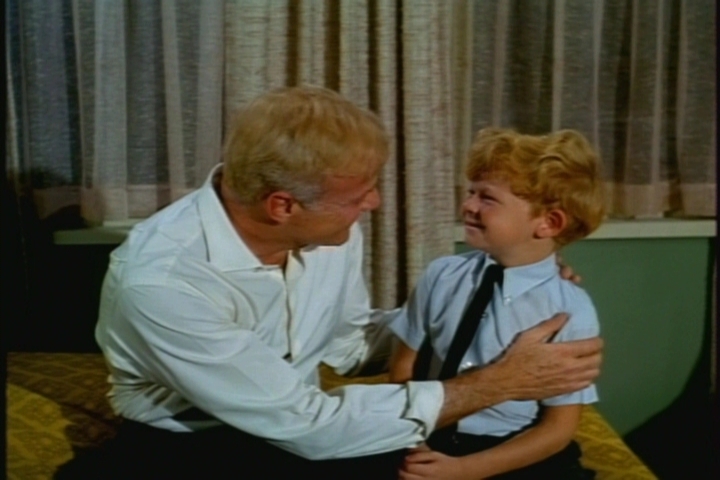 During Brian Keith’s scenes with Jody, I have often wondered about how the death of his son affected his performance. He was obviously a very private person who didn’t open up much in interviews, but he did seem to reveal a lot about himself through his acting. I almost included a photo of the Cissy and Jody baseball scene. I was glad she stopped playing catch with him as soon as he made that crack! Can’t open the bonus article (no picture available) ??? Weird…don’t know what happened there, but it should be okay now. Thanks for pointing that out. It IS okay now. Thanks. 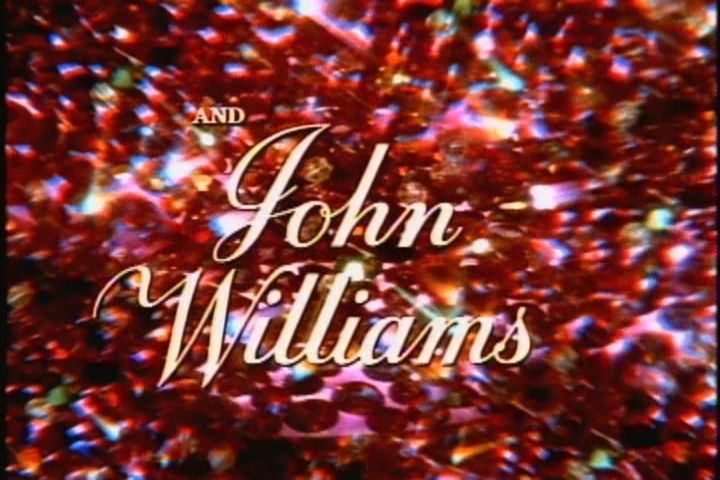 As much as I am a Sebastian Cabot fan, I really enjoyed the episodes with John Williams. He played the character in his own way which was refreshing. I like that in future episodes there is reference to Mr French visiting his brother on Long Island. We can only assume this is the same brother?